These two long-unused Cadillacs are behind Vacationland, an out-of-business RV dealership. It’s across the Cedar River in a neighborhood I rarely go to—North Cedar. It’s a scrappier part of town. April 14th was the first spring day warm enough to draw outside. For the two hours at my easel, spring peepers chorused their froggy, vernal mating song from a marshy backwater, just beyond the woods. It’s a quiet corner of town, not much traffic. A small trailer park adjoins Vacationland’s lot. I set up on the grass, a few beer and Red Bull cans scattered here and there—between the street and the chain-link, barbed-wire-topped fence. Absorbed, I hardly noticed when the pick-up stopped alongside me. Through the open window the driver called out, “He won’t sell ‘em. I’ve asked and he won’t sell ‘em.” I turned to meet the voice—a guy my age, mid-60s, in a T-shirt, the cab of his truck strewn helter-skelter with stuff on the passenger seat and the dash. A half-eaten white bread baloney sandwich sat on the center console next to the shift. “I’m not much interested in cars, except to draw them.” I countered, “I like looking at them”. “You live in this neighborhood?” I asked. “My mother lives here. She’s 90. I grew up here. After the 2008 flood I thought this neighborhood was a goner. I thought it would never come back. But now the hippies have moved in and prices have gone through the roof. Can’t afford it. You some kind of artist?” As if he had just noticed that I had something else going on other than talking with him. “Well, thank you. Here, I’ll give you one of my postcards.” He looked at the picture and then the other side. I pointed out where my website address was and where he could look to see the drawing that I was working on when it was done. “You better sign this then.” And he handed me back the card and a pen. “Some of us are lucky.”, he said, and he drove away. I took this photo and stepped back to my easel. 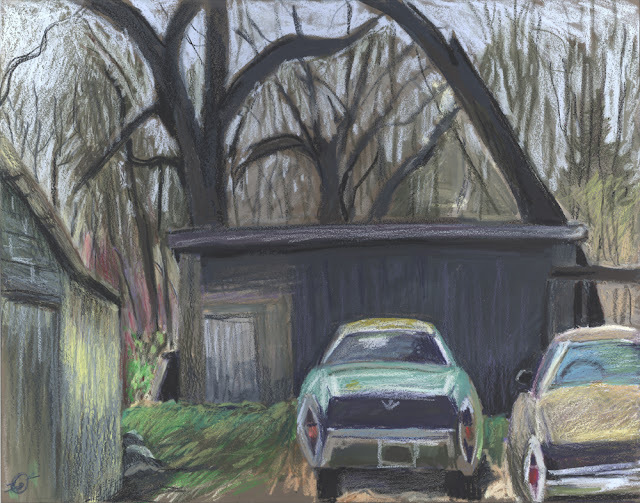 At home, I ate lunch and contemplated that, as I often find, I had gotten more than a drawing of two old cars. I had gleaned yet another facet of the community where I’ve lived for 30 years. I had talked with someone I would never have met if it weren’t for me standing on the side of road drawing in a neighborhood that is not my own.